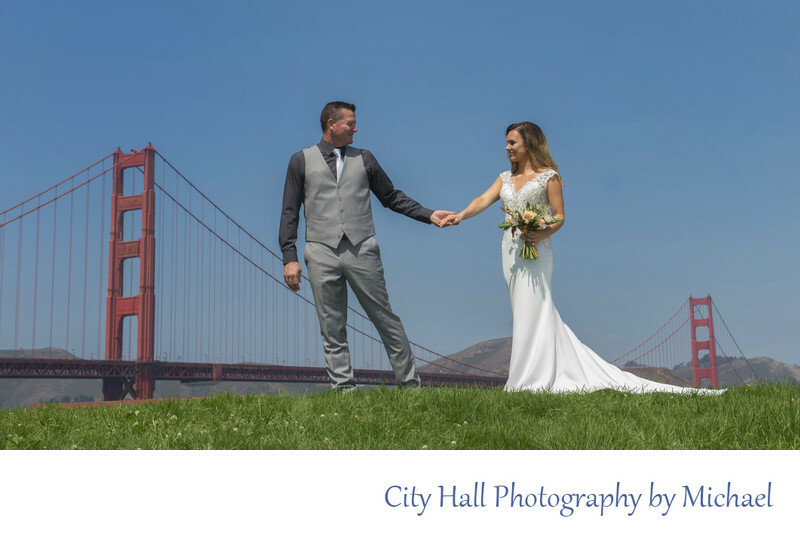 This nice couple came all the way from Tasmania, Australia to get married at San Francisco City Hall. It was just the 2 of them for their city hall ceremony which took place in the Mayor's Balcony on the 2nd floor overlooking the Rotunda. They reserved the entire space for their ceremony despite having no guests. This provided them with great privacy and made for a very intimate wedding ceremony. We enjoyed being part of it and did what we could to make it special for them. After the ceremony we took them on our photo tour around the building and then posed them in front of the famous City Hall Sign outside of the building. We then loaded into the car and drove to the Golden Gate Bridge for a whole series of shots. We chose Crissy Field this time because it was very clear day.